Ever start something and think: This is gonna be AWESOME! 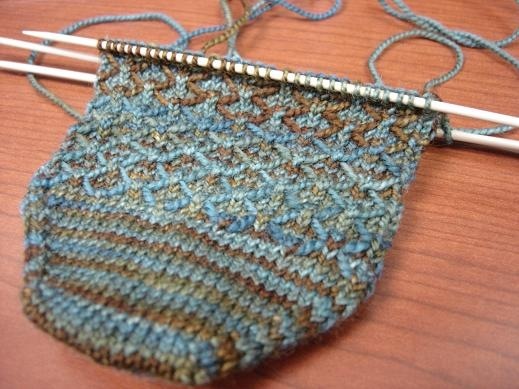 I have been completely in LOVE with this sock pattern for a really long time. I even went out of my way to purchase some Kettle Dyed navy blue yarn to make some (just like the first pair I saw) so I am not sure what exactly made me decide to try and use this yarn for a pair of Leyburns… maybe it just wasn’t meant to be? I was able to cast on yesterday and got up past the toe and into the stitch pattern a little ways… the pattern itself was actually easier than I thought it would be. I’ve never knit anything with yarn loops hanging out, so I wasn’t sure what to expect really. I worked on it last night for a couple hours, but really wasn’t feeling it. 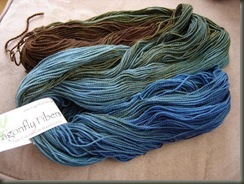 I do very much love the colours.. the greens and browns and blues meld so nicely together! but because this is a 2 ply yarn, the “Stringy” parts of the stitch pattern look sloppy to me for some reason. I think maybe it needs a smoother yarn, or maybe one with more plies to look correct. 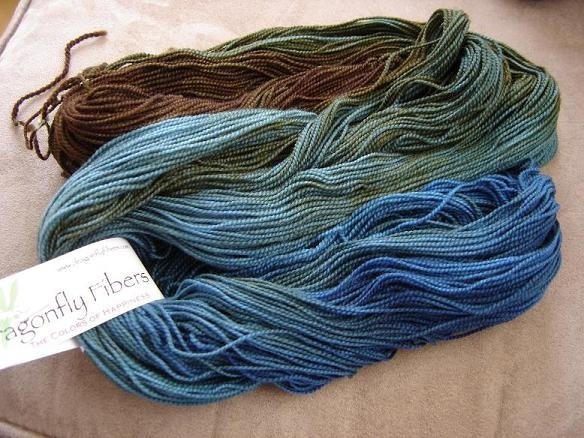 I also liked how the yarn wasn’t really pooling or striping up anywhere, but was creating a nice mix of the shades. With heavy heart… I did the unthinkable… I put it away for the rest of the night (in favor of spinning some of the Lime green yarn waiting to become Fiddlehead Mitts) and this morning – I frogged. I know someday I will make this pattern for real, but for today, i think my extraspecial Dragonfly Fibers yarn should be something else. I think maybe something with curvy lines or rippling waves to show off how nicely the colours were blending? The hunt is still on, and I am open to suggestions if anyone can think of a good pattern to suit this yarn? 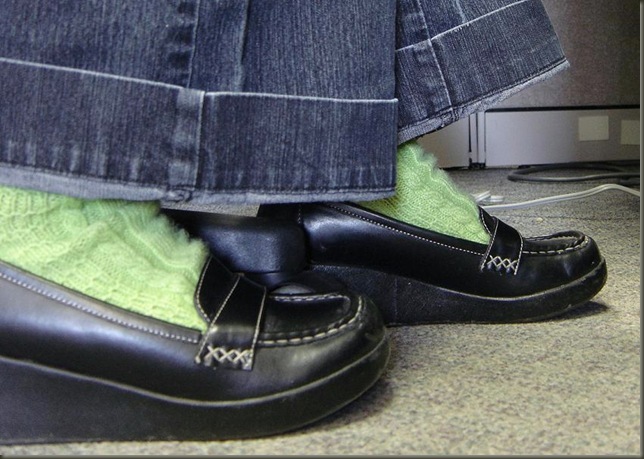 So Who wears homemade socks? ME. I guess I got all excited, finished this, blocked it, and the forgot to tell you all about it! I know it’s a little late, and there are no “fashion” pictures of it being worn… but I still want to share. 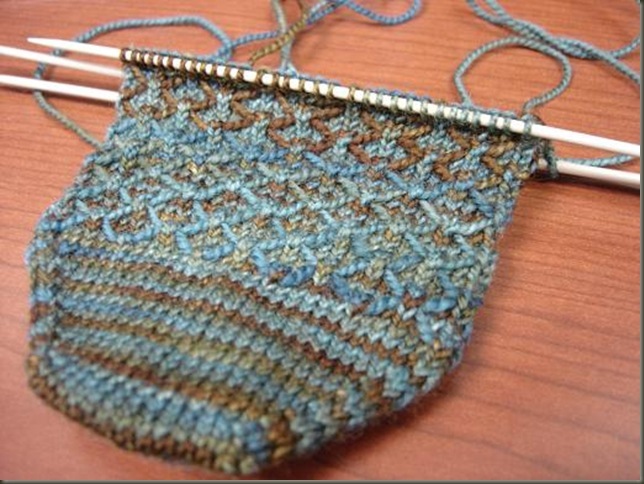 The yarn is KnitPicks Shadow lace in “Bordeaux” Kettle Dyed… and truly was a joy to work with. I Didn’t even find that the color bled that much after the soak (which surprised me a little since it is burgandy red… and I had counted on it being a little messy at the very least. I finished the whole shawl with just over one skein which is a complete steal price-wise… less than 5 dollars for a pretty gift, and beads that I already had upstairs in the stash! All in all, a very economical, pleasing and satisfying lace project! The Nightsongs pattern itself was a bit of a challenge for me… since it was the first pattern I’ve followed that had only diagrams, and no written out instructions to fall back on. I think this was a good thing though because it made me step outside my lace knitting box and try something new. In the beginning I had considered writing out my own version of the chart but decided to slog it through and really focus on “reading” the knitting itself, and watching the pattern unfold. At first this was quite difficult… and a little frustrating. I ended up cutting up the pattern charts and taping them together in places so I could visualize things better. I looked at lots of project photographs on Ravelry to see if my design was working up correctly. A big thank you to all of you who posted your own project details and close up photographs… they really really helped me a lot! Since then, I have found a whole bunch of teeny tiny crochet hooks… at the local dollar store of all places! so I got various sizes, and they also had yarn needles. I bought a bunch of those too… I don’t know about you, but I can never find one when I need one! The blocking process was neat and tidy. The top of the triangle was done with 2 wires bound together with tape and pinned out at even intervals, and the sides (I love points!) were strung along more wires and spread out. The lace had great stitch definition and the color seemed to really fit with the design. I liked how the kettle dyeing gave some ‘Splotches’ of lighter and darker color. I think it was just enough to add some interest, and wasn’t so busy that it took away from the design itself. The beads are simply plain clear with silver lining. Sometimes simple is the way to go I guess? I can’t quite figure out if this design reminds me more of “hearts” or “spades”… I guess it depends on your vantage point? All in all, another successful lace adventure, and hopefully a perfect holiday gift for a deserving lady.